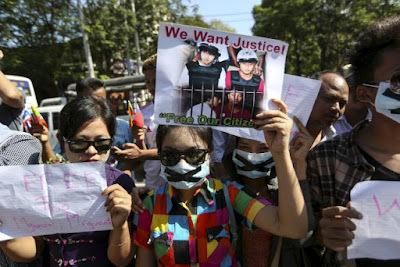 Hundreds called for the release of two Myanmar migrant workers in a protest in Yangon, Myanmar's biggest city, on Friday, a day after a Thai court sentenced the two to death for the 2014 murders of two young British tourists. The court convicted Zaw Lin and Win Zaw Htun of the brutal murder of Hannah Witheridge, 23, and David Miller, 24, on the Thai holiday island of Koh Tao, a case mired in controversy and questions about the police investigation and Thailand's treatment of migrant workers. Around 1,000 people gathered in front of the Thai embassy in Yangon on Friday, police said, calling for the two to be freed. Dozens of police stood guard and closed a lane in front of the building. Some protesters held signs saying: "Shameless Thailand government" while others shouted "We want justice" in English. They demonstrators dispersed after their request to see the Thai ambassador was turned down. The verdict followed a trial that saw prosecutors build much of their case around DNA evidence that police said linked the two migrant workers to the crime. Defense lawyers argued that police had mishandled the DNA evidence and that the two men were tortured while in detention. The killings sullied Thailand's reputation as a happy-go-lucky tourist destination and raised questions over its justice system and its treatment of migrant workers. U Win Maung, Myanmar's Ambassador to Thailand, said the verdict would not affect diplomatic ties. "Everyone who is a human, if they hear that they are getting the death sentence, they will be sad, but this is the legal procedure so we have to adhere to the legal procedure," U Win Maung told reporters in Bangkok. Some activists have argued that the defendants were scapegoats. Thailand hosts about 2.5 million migrants from its poorer neighbor, many of them working in the fishing and construction industry or as domestic helpers or cleaners in hotels and restaurants. Amnesty International called for an independent investigation into allegations the Myanmar men were tortured, adding that police in Thailand had a "long and disturbing track record" of using torture to extract "confessions". A judge dismissed allegations of torture in the Koh Tao case saying there was no evidence it took place.